BGR FAB: Best Tube Notching Tutorials I've Found Yet. Best Tube Notching Tutorials I've Found Yet. As I continue to learn and work at becoming a better fabricator (I still have a long ways to go), I continue to struggle to find balance. In what way you may ask? Well…in many ways actually. One of the most challenging ways has to do with tools. What tools do I really need to buy? Or, which tools are so specific in use, that they do not provide the value vs the cost at this particular moment? When I refer to tools that provide the value vs cost, I’m not referring to selecting a lesser quality, less expensive tool, over say a more expensive, better quality tool. No. I’m referring to the decision to buy a special purpose tool (that usually cost a decent amount of money) over finding a bit more time consuming method, that is a bit less expensive. Both of these options have their tradeoff’s. Typically, the three biggest aspects effected by such a decision are, price, time, and quality/aesthetic appearance. While I’ll not get into my thoughts on which of these 3 aspects are the most important (that’s an article for another time), I will say that this is a difficult aspect of being a DIY, hobbiest fabricator. In my case though, it’s more than a hobby, it’s a necessity of life due to where I live in Chile, S.A. Therefore, I’m constantly on the lookout for methods of producing the best quality possible, without having to have: 1) A 1200 sf shop to store all the tools in, and 2) Not having to invest a fortune in tools I may use once a year. To save money on tools, always means a trade off of time, and usually quality. That’s not to say that by doing these jobs without the professional, or the job specific tool, that you’r project will be unsafe, or turn out a bust. It just simply means that you will most likely have to understand that it will be hard for your project to pass tech inspection of a sanctioned racing comity, and that your, most likely, not going to produce a fabricationer’s piece of art. Tube notching is one such job (as mentioned above). Fact of the matter is, there are numerous tools to choose from for notching your tubes. Still, if you are like me, it’s hard to justify a 150 plus dollar tube notching tool, when you may notch tubing once every 1 to 2 years. For me, my market demand is just not there. Neither is my income. Not to mention, that most $150 tube notchers are not all they’re cracked up to be. Generally speaking, from the reviews I’ve personally read, these notchers need a bit of modifying and manipulating to get them to work right. Please understand that I’m not trying to take credit for these tutorials that I happened to run across. In fact, one of the tutorials is so basic, I should have thought of this method on my own, but didn’t. The other tutorial, I would have never figured out on my own. Even though it makes perfect sense. By chance, I ran across a Facebook post someone had put up linking to “The Fabricator’s” video series and website. This guy does 3 thing really well. He explains simply and quickly, he shows what and how he’s doing it clearly, and let’s not forget…he can turn out some fabrication! Again, by chance, I ran across Bleepin Jeeps tutorial as a suggested video that youtube suggested at the end of “The Fabricator’s” video. Therefore, I felt that these would be good tutorials to pass on to you guys. I could go thru all the details of how “The Fabricator” teaches you to notch tubes, but that would be a waste of your and my time. To get these details, go to his page, read the post, and watch his video. Do both of those things though. You will probably understand, and remember better how to use this method in the future. One thing that i would like to mention here though. “The Fabricator” is using a metal cutting chop saw. This is something to take note of. It’s important, because if you choose to cut your tubing with an angle grinder, you angles won’t be as precise, neither will you’re cut lines be as straight. Both of which will effect the fitment of your tubing. So, before you start your project, just understand the differences between him using a chop saw, and you using an angle grinder. If that’s all you have. Bleepin Jeep’s video is one that is very useful, and very basic. In most cases, you’ll probably realize that there are only 2 details mentioned that you have not already thought of. At least for me, that was the case. Since Bleepin Jeep took the time to make this tutorial though, you’ll have to watch it to learn what method Bleepin Jeep came up with to help us beginners in fabrication notch our tubing. 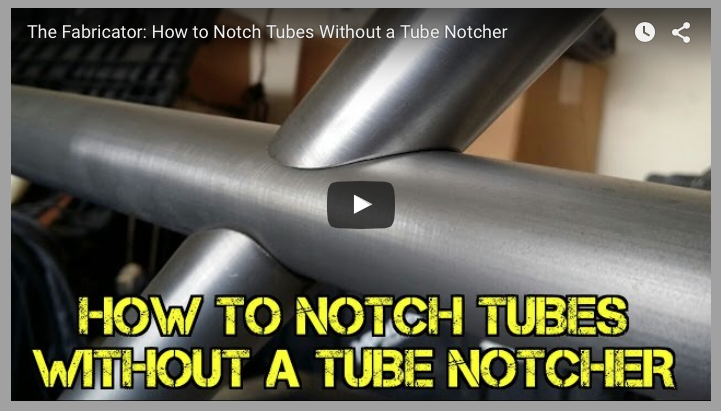 Seeing as though this tutorial is being featured in the same article as the tutorial from “The Fabricator”, I think it’s only fair to mention that this tutorial is probably going to work best on 90 degree tube notching. This, however, will depend on a few factors. Tube size, degree of angle needed for the notch, your ability to measure correctly, as well as the length of the hole saw’s pilot bit. All of these are going to be important factors to make this process work with a degree of notch that is greater or lesser than 90 degree’s. Still, as I mentioned before, this is a simple, but very effective method for notching tubing with the most basic of tools.